The Team: Ragnarok has arrived! The basic combo of the team is to use Surtur with Confront The Mighty. 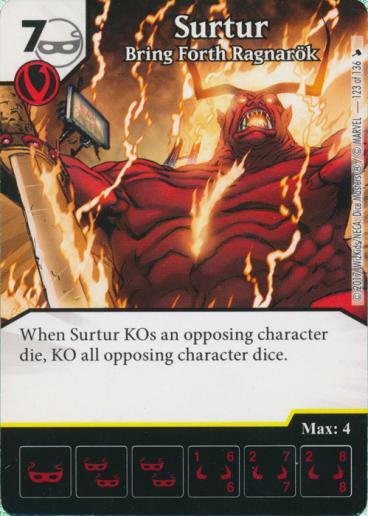 Use Confront to have Surtur KO an opposing character, thus KO’ing all opposing characters, and then attack for lethal damage. In order to win using this, I need some other characters to deal damage, because Surtur could end up with only 1 or 2 attack after using Confront. 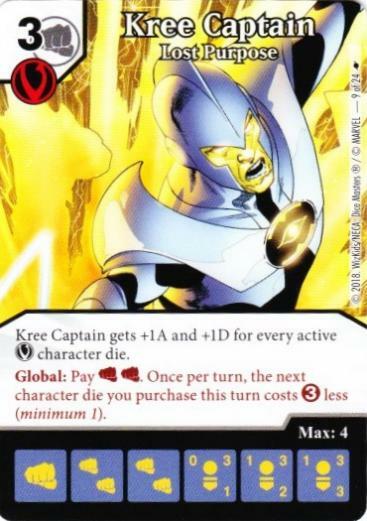 I went with Kree Captain; the global helps me get Surtur faster, and the character serves as a great battering ram. 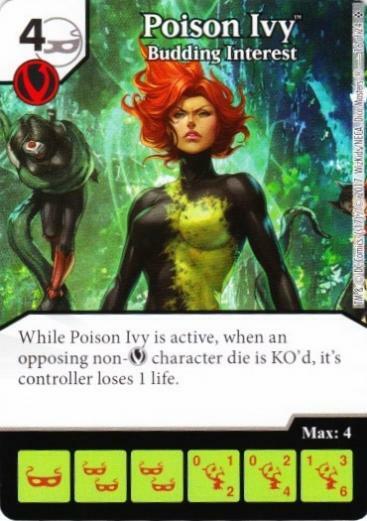 I also used Poison Ivy to complement this; her ability uses those KO’s that happen from Surtur’s ability, and turns them into damage. Plus, she’s a villain and thus helps buff Kree Captain. Definitely a nice fit. To continue adding villains, I then added Kree Soldier and Supreme Intelligence. The Soldier has Swarm and Infiltrate, gives me fists for Kree Captain’s global, and just serves as a really useful character. Supreme Intelligence serves three purposes: Fabricate can help me ramp to Surtur, the character’s ability helps add some damage whenever I field a Kree, and the global can help me prep a Confront The Mighty if needed. I put in Shriek, Wrecker and Scarlet Witch (a.k.a. SWitch) for control. All three are villains, thus buffing Kree Captain. Shriek serves for blanking, Scarlet Witch is there so people don’t use Confront The Mighty against me, and Wrecker is there to shut down any annoying globals. And seeing as everything I have is a villain, I put in Villainous Pact for a bit of extra ramp and an alternate win condition if I’m up against non-villains. I started off against a Batiri Battle Stack + Doppelganger team that uses Magic Missile + Staff of the Forgotten One for removal. Yes, that combo works very, very well. Thankfully, though, I have SWitch, so his Staff was never a threat. I didn’t even go for Surtur; instead, I’d use Confront The Mighty and Magic Missile for removal with Poison Ivy active for some early burn. Add to that some Kree Captains and Supreme Intelligence to act as battering rams, and I wore my opponent down faster than he could set up. I won. Oh, look, a Dragon team! Wait, didn’t he tell me he was going to switch? Ah well. Again, I went for SWitch first to slow down the Ring of Winter shenanigans and Shriek to slow down Gold Dragon. I then started setting up what I could. It took me longer than I’d like, but I eventually got Surtur out along with some Kree Captains, and I rolled Confront The Mighty. Surtur confronted a dragon, the dragons fell, and the Kree charged in for the win. 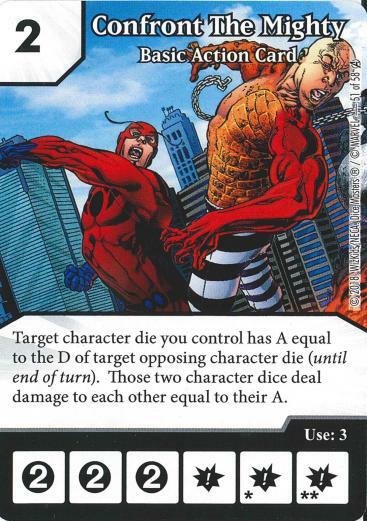 This time, I was up against the crazy Swarm team from before, now with Doppelganger to use with Batiri to first burn with Parademon, then swing in with big bruisers…that was the plan anyhow. I had weird rolls and bought two Confront The Mighty dice early. It worked out to be such great removal against his Batiris that he didn’t get to trigger Swarm once. (he now really, really hates Confront The Mighty) I slowly set up my board while keeping up the removal, did the Surtur + Confront shenanigans with Ivy active, and swung in with some Kree Captains for the win. For my final game of the night, time to face off against the Thanos that doubles Overcrush damage. This team is crazy. She now had Doppelganger to copy Thanos. Yes, she could have multiple double-overcrushing 9/9s, easily. That’s as nasty as it sounds. Another point I have to bring up about that team is the ramp engine. My opponent was using U The Spot with SR Mimic. I should point out that this interaction is the subject of debate right now; I’ve submitted this to the WKRF. But the way it was ruled, for now, is that when Mimic copies The Spot, because of the Copying Guide, Mimic takes The Spot’s text, but replaces all mentions of “The Spot” with “Mimic”, including the part excluding the ability from triggering itself. The problem is, because Mimic doesn’t take The Spot’s name, now The Spot does not exclude Mimic, nor does Mimic exclude The Spot. So when Investigation gets used (draw and roll 2 dice), they end up perpetually feeding off of each other until you have nothing left to draw, and you just roll your whole bag. Which is crazy. Again, this is currently a subject of debate, and I will plug in an edit to this post if the WKRF makes a decision. In the meantime, if you want to use this, please talk to the head judge at the event first to see how they would rule it. As for how the game went, she went for ramp, I went for Confront The Mighty for removal, and I did some setting up with Kree Captains and such. Eventually, she got the “roll everything” turn to happen, rolling 16 (!) energy. She bought Thanos, 2 Doppelgangers, and used Pact’s global to set up a turn that should’ve been my death. But on the following turn, I drew Confront The Mighty and Surtur, rolled both, removed her board, and swung in just, just in time. Very close call on that one. -Surtur + Confront is a crazy good combo. Being able to use a 2-cost action rather than a 4-cost makes a huge difference in making R Surtur viable. -That Poison Ivy is impressive as all heck. Even when just attacking with Kree Captain, chump-blocking with a sidekick hurt my opponent. It brought life down little, by little, by little, and it was hard to stop. I also find it really cool that her ability causes life loss, not damage, meaning she bypasses Bishop. -Kree Soldier is really interesting. Mixing Infiltrate with Swarm is a recipe for bad decisions for my opponent, and he always helped one way or another. -Supreme Intelligence’s global is…okay? Saving up 2 energy will work sometimes, but you really have to go out of your way, and it feels weird to do. Maybe I just need to practice more with it. Overall, I liked this team a fair bit. Lots of fun things here, and I feel I’m just scratching the surface of what the new cards can do. I don’t see why the Mimic/Spot interaction would not work the way you played it. It actually feels fairly straightforward.